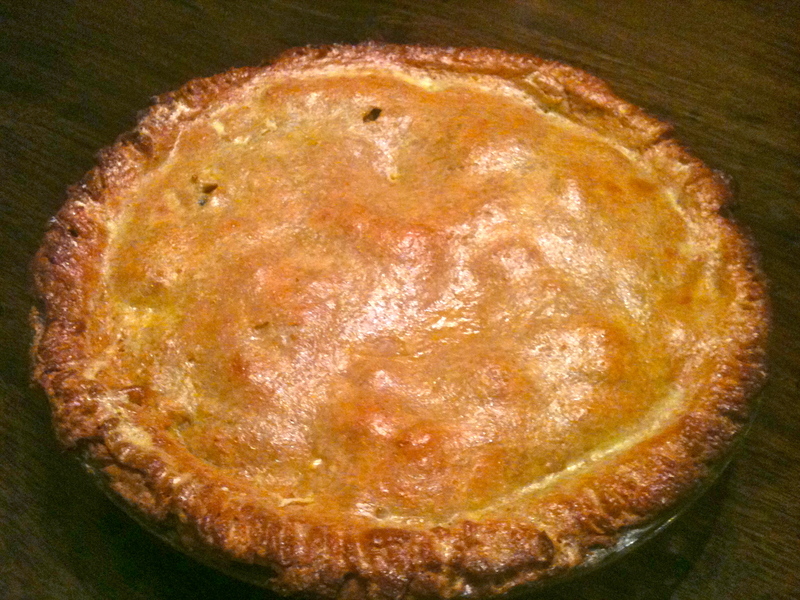 Growing up, my family used to make chicken pot pie using the easy recipe on the back of the Bisquick box. But the dish we’d end up with always turned out flavorless and dough-heavy. 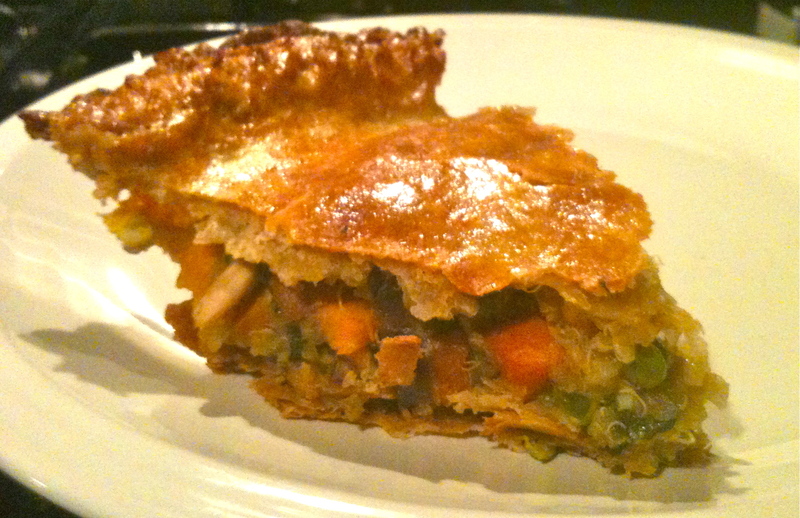 This recipe is your cure for the common pot pie! And you won’t miss the chicken at all; it’s so robust and flavorful that even the manliest carnivore won’t miss the meat! First, prepare the crust. Let the butter sit out while you mix the dry ingredients. Combine the flours, sugar, salt, pepper, and cumin with a fork. Then cut the butter into cubes and break it into the flour mixture, using a fork to combine. Chunks of butter are okay! They melt and make the crust flaky and good. Slowly stir in the milk. You might not need it all–add just enough until the dough holds loosely together. Cut the dough in half, cover, and refrigerate while you prepare the filling. Cook the quinoa. Bring one cup quinoa and one cup liquid to a boil, then turn down to simmer until the liquid is absorbed. Set aside. Heat olive oil in a large skillet over medium. Cook onion, garlic, rosemary, paprika, salt, cumin, and pepper until onion starts to soften, about 3 minutes. 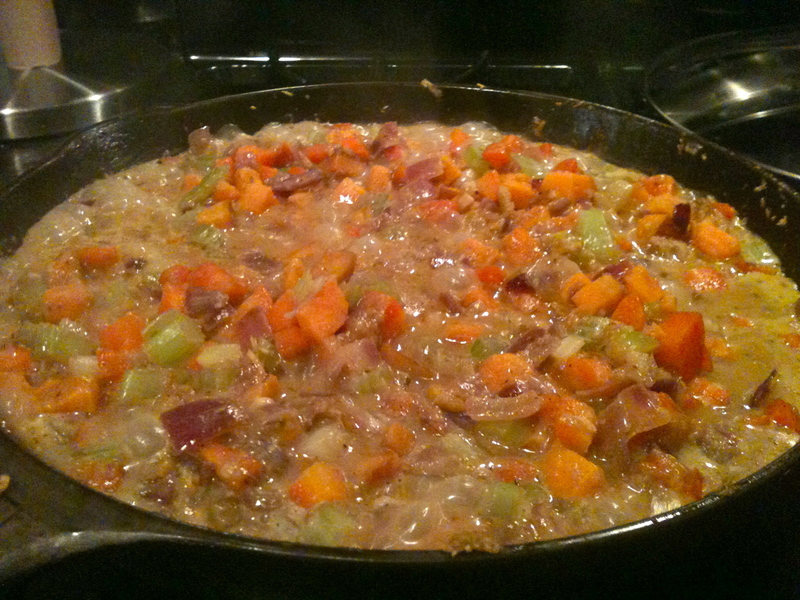 Add celery, carrot, and sweet potato and cook until veggies start to brown, about 8 minutes. 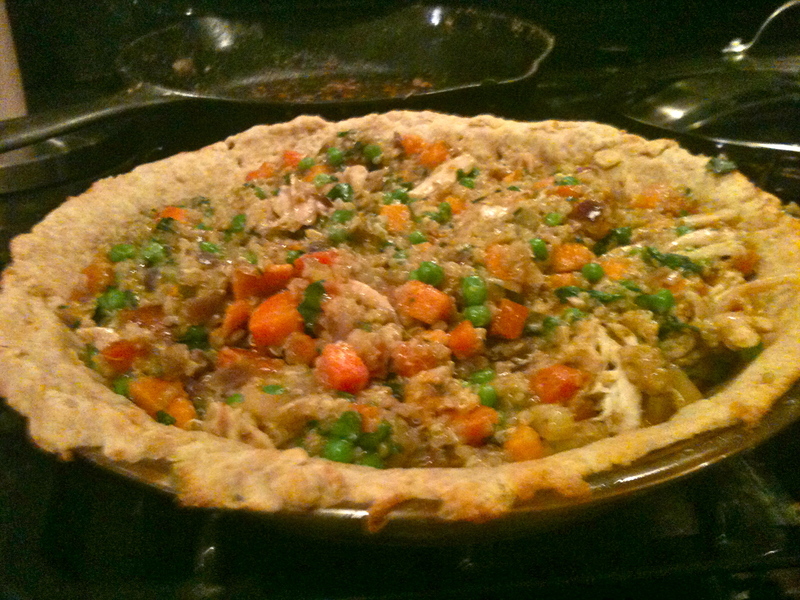 While the veggies cook, prepare the bottom layer of crust. On a floured surface, roll out half the dough until it’s slightly larger than the size of your pie pan. Drape the dough over the pan, and press it into the sides to fit. Trim the edges. Bake the crust for about 8 minutes and then remove from the oven. Back to the vegetables. Stir in the flour to evenly coat the veggies. Cook out the raw flour taste, about 2 minutes. Now add soy sauce, red wine, and lemon juice. Stir to combine. Cook for another minute before adding milk. Simmer until the milk becomes like a gravy or sauce, and remove from heat. In a large mixing bowl, combine cooked veggies, spinach, peas, and quinoa. Fill your pie crust. Now prepare the top crust. On a floured surface, roll out the second half of the dough so that it will fit easily over your pie. Trim the edges and crimp the two layers of crust together using the prongs of a fork. Make the egg wash by scrambling the egg and adding a splash or water or milk. 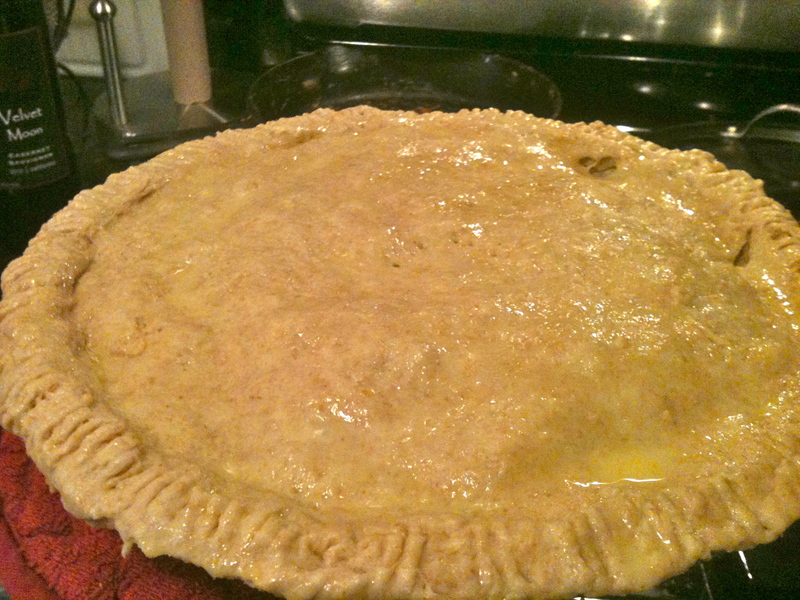 Brush it over the crust, especially along the crimped edge. Poke a few holes in the center with your fork and bake for 15 minutes. Brush with egg wash once more, and return to the oven for 10-15 more minutes, for a total bake time of 25-30 minutes. Let it cool a bit and enjoy! Previous Rick Bayless’ Mango Guacamole. Delicious and so easy! My husband and teenage nephew who both cringe at the thought of veggies, finished the pie! This is now a go-to meal staple.